ALL 40 swimmers set personal records !!!!!!!!!!!!!!!!!!!!!!!!!!!!!!! WEST finished in a second place( 1st - Guelph, 3rd - London) out of 21 teams. WEST swimmers won over 100 medals ! The selection criteria for the Windsor Essex Swim Team is quite simple. We have selected the forty swimmers in the Team who the coaching staff feel stand the best chance of scoring the most points for the Team. We compile this data based on a comparison between this year’s performances, swimmers personal best times and last year’s Team Showdown results. By basing selection purely on the potential to score points, we are able to make fair choices that are cut and dried and void of any perception of “playing favorites”. It is worth noting that all ages are scored equally, but there is no rule stipulating the number of swimmers required for each age-group. It is, however, most strategic to select at least 3 or 4 per age-group in order to fill out the age relays. It is conceivable to select only three in an age-group, as it is possible to move swimmers up to an older aged relay; it is also possible to select 5 or more in an age-group, provided they all stand a strong chance of scoring points. The first criteria the coaching staff looks for when selecting the team is strong relay swimmers, as relay points are scored double. In some cases a strong relay swimmer might get the nod over a strong individual swimmer, simply because of the aforementioned fact. Also, we are pretty much guaranteed to take at least eight or more 10 & under swimmers, as we need four in each gender to fill the relays as we cannot move anyone up. It is also worth noting that it is possible for a weaker swimmer from one age-group to get the nod over a stronger swimmer in a different age-group or gender. This is because some age-groups tend to be much stronger and deeper than others and consequently, the weaker swimmer may stand a stronger chance of scoring more points. All swimmers on the WEST are equally important and special. Not getting selected for the Team Showdown team is nothing to hang one’s head about. As we are limited to selecting 40 of more than 160 competitive swimmers on the Team, some good swimmers will get left off the squad. As this is only one meet in a very full year long calendar, there are plenty of other great opportunities to swim fast and represent WEST with pride. * 22 swimmers won medals ! 37 swimmers raced in finals ! 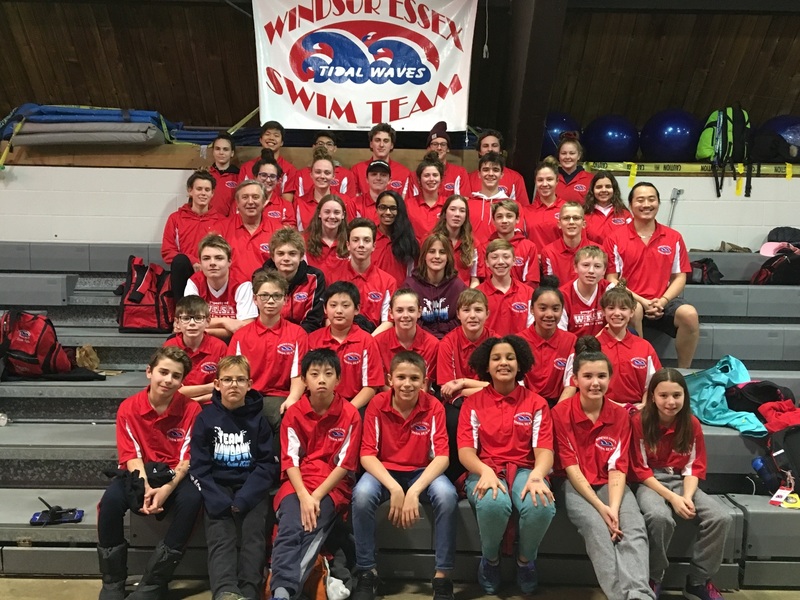 * 36 WEST swimmers qualifyed for Provincial Championships and Festivals. * For nine swimmers that was the first Provincial meet. All nine swam their best times! WEST has Great Future ! The fact that we are one of the better teams in the Province qualifies us for the first of three divisions. By virtue of being in Division I, we are allowed to bring fifty swimmers to the Championships. The selection criteria for the Windsor Essex Swim Team is quite simple. We have selected the fifty swimmers in the Team who the coaching staff feel stand the best chance of scoring the most points for the Team. We compile this data based on a comparison between this year’s performances, swimmers personal best times and last year’s Division I results. All swimmers on the WEST are equally important and special. Not getting selected for the Team Champs team is nothing to hang one’s head about. As we are limited to selecting 50 of more than 160 competitive swimmers on the Team, some good swimmers will get left off the squad. As this is only one meet in a very full year long calendar, there are plenty of other great opportunities to swim fast and represent WEST with pride. Swim Ontario did not organize a Team Championships in 2015. Division I Team Championships, December 12 - 14, 2014. Etobicoke. * Rachel Rode set a Club Record in 50 back -28.49 sec and ranked #2 in Canada in her age group ! !!!!!!!!!!!! WEST is the BEST in the TOP Division at Team Champs 2013 !!!!!!!!!!!!!!! Only 6 teams won the title from 1996: 4 teams from Toronto area , 1 team from Ottawa and WEST. * Maddy Lavoie, Katya Parker and Rogel Rios Galeana are first time qualified for Eastern Canadian Champs. Total of 19 WEST swimmers are qualified for Easterns in Windsor, February 13-16, 2014 !!!!!!! * 32 swimmers are qualified for Provincials. Boys Relays for 11-12 yrs and 15 and over. Girls Relays for 11-12 yrs and 15 and over. BACK TO BACK THIRD PLACES !!!!! WEST is one of the best swim teams in Ontario. Ontario Team Championships, December 14 - 16, 2012. Toronto, Ontario. Congratulations to the First time qualifiers: David Bezarevic and Marjorie Sloboda. Girls 15-16 yrs 200 Free, 200 Medley Relays and Boys 13-14 yrs 200 Medley Relay. Congratulations to all WEST swimmers who competed there !